Our July feature comes from Marie-Luise Ermisch of Canada’s McGill University, winner of the History Workshop Bursary to attend our international research conference this month. She writes on the topic of her conference paper: Oxfam’s Operation Oasis: Teaching British Youth about Global Poverty. Imagine taking a large group of secondary school students to a developing country. Through this direct experience, think about what these youth could learn about the developing world and international poverty. How would this knowledge shape their social and political awareness? This is precisely what Bill Jackson, head of Oxfam’s Education Department from 1962 to 1966, imagined and considered when he started organising Operation Oasis in 1964. His dream came to fruition when, in March 1966, approximately 800 British youth between the ages of 15 to 18 disembarked from the M.S Devonia into Algiers, Algeria. 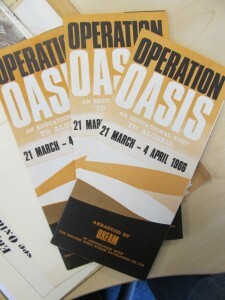 Operation Oasis was a unique educational tour that, at the price of £49 (approximately £745 today) per participant, offered students a four-day trip to Algeria. The itinerary included visits to cultural sites, such as the Kasbah in Algiers and the Roman ruins at Tipasa and Chercell, as well as a two-day excursion to Djelfa, an oasis town on the edge of the Sahara Desert where Oxfam was supporting irrigated farms and training centres for boys, both run by White Fathers (French Catholic monks). This four-day adventure was the culmination of several months’ worth of learning about all things Algerian, as Oxfam provided participating schools with educational material on Algerian history, geography and culture in the lead-up to the trip. But how can the success of such an educational adventure be measured? Did the students come back with the passion and compassion that Jackson had hoped the trip would foster? Certainly students gained memories of desert sunsets, Arab hospitality, and White Fathers in billowing robes standing on the border of desert and farmland. Upon their return home, many students increased their involvement with Oxfam or shared their experiences through talks at youth clubs, while others likely just let it simmer in their minds. That said, Ronald Payne, a Sunday Telegraph reporter who participated in the trip, wrote afterwards that having been taught to expect poverty, the youth saw it in places where it was not. 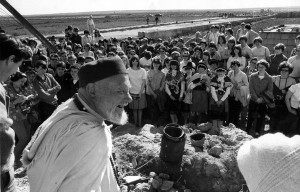 Payne was therefore critical of Oxfam’s emphasis on classroom learning and whether it translated into understanding once on the ground (6 April, 1966). Another journalist, this one anonymously writing for The Times Educational Supplement, was even more critical and wholeheartedly argued against the trip, stating that teenagers “tend to be particularly imprisoned within themselves, too self-conscious to share other people’s lives either imaginatively or in reality” (29 April, 1966). Cynicism of these journalists aside, the students’ overall evaluation was positive and there is evidence the teenagers were moved by what they saw. In a final report, one anonymous participant passionately emphasized that international poverty must be tackled by all, and that one step towards this was by fostering international friendships through initiatives like Operation Oasis. In a recent interview, participating student Linda Hisgett (née Anstey) fondly remembered the trip and affirmed that the hands-on experience of Operation Oasis increased her international awareness in a life-changing way, thus gaining Oxfam a life-long supporter. Operation Oasis was a daring initiative that was not to be repeated. As such, it highlights how NGOs in the UK sought to incorporate children and youth into their fight against poverty and suffering in the developing world in the 1960s. NGOs characterized the children and youth of the post-war baby boom as energetic and empowered, thus casting them as a resource that could be tapped. With this guiding principle NGOs such as Oxfam attempted to spur children and youth into voluntary action by appealing to their idealism and emotions and encouraging them to use their leisure time to fight the war on want. As a result, NGOs motivated young people to fundraise, volunteer overseas, act as ambassadors for the developing world, build international friendship networks, and campaign for a better world, all on their own time. Operation Oasis raises many questions about the nature of international development work and how it is carried out in the Western world. If, as many have argued, international development is now a self-perpetuating industry, the very foundation of development work depends on its emotional appeal and its continuous impact on education, culture, politics, and the public imagination. This makes the historical examination of NGO’s relationship with children and youth all the more important as it reveals the potential roots of motivation behind voluntary action. Dominique Marshall and Sally Taylor. This entry was posted in Conferences, Events, Features, Marie-Luise Ermisch, New Researchers, VAHS2013 and tagged Africa, children, education, transnational histories, voluntary sector, volunteering, youth work. Bookmark the permalink. I fear Operation Oasis sounds cultish: “Operation Oasis increased her international awareness in a life-changing way, thus gaining Oxfam a life-long supporter.” Religions have life-long supporters because they cannot be proved wrong (or right), but a civic society organisation has support only so long as it takes the right decisions and a charity only as long as it spends our money well. Unless I misunderstood, Oxfam also took a self-selecting group whose parents could afford the equivalent of £750 for a holiday ‘to increase awareness’, as lobbying charities like to put it. There is this idea that (young) people who gawp at poor people abroad are somehow more rounded. The challenge is to get people to work with the poor at home and to suspend their judgement of those people – much easier to do if your poor don’t speak English and look different to you. If you understand poverty in its context, not as some abstract injustice or exotic problem, you see that the way we distribute our resources, and compensate for the lack of natural talents, has a lot to answer for. Working with the poor who look like us would help to make young people to think politically, which does make a person more rounded. The idea now -and apparently in the ’60s – is that you can train people to become empathetic and that, plus uncritical donations, is all that’s needed to combat poverty. I’d be interested to read the minutes of whatever Oxfam committee discussed this idea back in the day. Was the motive we attribute to them now the same then? How did the ’60s idealism translate into this policy of school trips for teenagers rather than, say, poverty conscious raising workshops, sit-ins on Parliament Square, etc? And how long have they been the only charity with a stall at Glastonbury? In case of misunderstanding, I support much of the work that Oxfam does, just not all of it all the time. Judith! Thank you for your thoughtful comments on my blog post. You have given me many things to think about while I continue to work on this topic and I do agree with most of the points you make. I will respond to some of the questions you raise in more detail as I tackle them in my dissertation. Regarding the Oxfam minutes – they have just been transferred to the Bodleian Library at Oxford University and will not be available to the public for a while yet which really is a shame. Thank you again for your comments! And thank you for reading. Thanks for a really interesting post. It had me wondering: why Algeria? The choice doesn’t seem neutral given that the country had gained independence only a few years earlier (1962) and due to its liberation struggle had come to the position of leading light amonst third-world revolutionary movements. So lots of militants had chosen Algeria as the place to discover the third world and explore their own political aspirations. Interesting context for a development trip by Oxfam. Do you mean the schoolchildren would not have been safe, given the number of militants (meaning people armed with intent but not police or soldiers?) floating about? Or that Algeria was a modish place to go and not chosen because it had lessons to teach about poverty? Neither, I must admit. I was really wondering whether left-wing sympathies of the kind that prompted others to be interested in Algeria in this period also influenced Oxfam’s choice. Perhaps a little modish, but not just because of fashion. And by ‘militants’ I didn’t mean ‘people armed with intent but not police or soldiers,’ I meant activists, volunteers, campaigners. People went their to teach at high schools, to establish medical clinics, to work with government or run newspapers, all sorts of things, often white-collar work. Undoubtedly armed groups were interested but they were just one part of the environment and not necessarily the most relevant to Oxfam’s work, it sounds. I understand. Many on the left in those days would have said were internationalist. Charities were an unfashionable cause, a bad word for decades. It wasn’t a solution, just a sticking plaster and as such highly conservative. Since then Oxfam and others have added lobbying on issues other than the urgent humanitarian assistance, on development, taxes, just and unjust wars and so appeal to a post-ideological generation that wasn’t born in the 1960s. I don’t think militant can bear so many meanings. Activist is quite adequate. There had been a great deal of blood shed in Algeria before the revolution – and since – so militancy in that context makes me think of bombs in cafes. Eleanor and Judith – thank you for your interesting discussion on “why Algeria?” The reason that is most often cited is because it was logistically easy (ie. closer than, say, Uganda or Kenya) and because Oxfam had been doing a lot of work there precisely because of the liberation struggle (and hence had good relationships with people on the ground and in the government). That aside, the question of Algeria was also raised during the Voluntary Action History Society Conference this July, but with a different slant to it. Conference attendees pointed out that, considering that Operation Oasis happened during the period of British decolonization, the choice of a former French colony, rather than a British one, is interesting. What kind of repercussions did this have for the students? Again, this is something that I need to think about in more detail, alongside the comments you both made. The Algerian context is very important to Operation Oasis as you rightly point out. That said, Oxfam was introducing the participants to missionaries and other agents carrying out practical development projects. While some of these people could be classified as activists, I believe that would misconstrue their primary objectives (the White Father’s missionary mandate, for example). Based on my investigations thus far, it seems that Oxfam was not connected with the more radical political constituencies in Algeria at the time. Thank you again for this very interesting feedback! Great! Off to look up what else was happening in the world that year.